Thrust out of the Otherworld to save his life, Tobin finds himself behind the lines of the cannibal army that has been attacking the Realm for years—and they do take prisoners. In fact, Tobin soon learns that healing magic that makes the barbarians so hard to kill comes from the combined sacrifice of a human and a nature spirit, forcibly fused into one body, killed, and then…well, cannibals. As a prisoner-slave, Tobin will find himself on the sacrificial block as soon as they can capture a nature spirit. He has to escape, to report what he’s learned. But the Realm already knows that the barbarians can heal any wound, in a handful of seconds—that’s why it’s been impossible to defeat them. What’s the use of reporting the source of their enemies’ power, if Tobin can’t figure out some way to negate it? Back on the Realm side of the line, Jeriah is appalled to discover that the Goblin’s leader, the sorceress Makenna, has lost his brother! And Jeriah still has to keep his vow to find some way to save the Realm from the barbarian army. With Makenna as his prisoner—she’s still charged with several murders from the Goblin/human war—he might have some leverage. Makenna cares nothing for any human except the missing Tobin, and her Goblin army is in more danger from the humans than the barbarians. 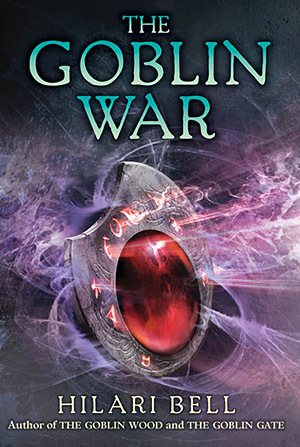 Makenna sees this threat to the human Realm as her best chance to win the Goblins their freedom…but then the barbarians will become a danger to her people, as well as the humans. If the three of them can’t figure out some way to stop an unstoppable army, both the Realm and the Goblins will die. In this fantasy sequel, the final volume in the trilogy that began with The Goblin Wood, a highly suspenseful plot leads to a thoroughly satisfying and surprising conclusion.